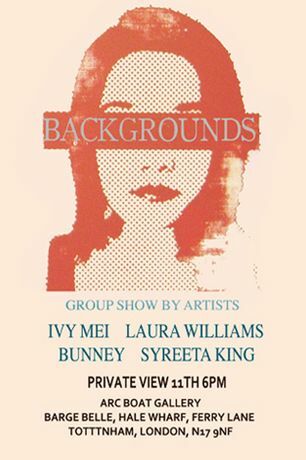 BACKGROUNDS Ivy Mei, laura Williams, Bunney, Syreeta King CURATED BY IVY MEI âBackgrounds' is a group exhibition by four emerging artists; it is organisational and indicated a matrix of backgrounds. Each of these artists explores their backgrounds in different styles and concepts in relation to feminism, unresolved and cautious works. Opening Friday 11th November 6pm - 9pm arc Gallery 11 Hale Wharf, Ferry Lane, Tottenham, London N17 9NF Transport: Tottenham Hale (Victoria Line) (5 mins walk) Buses to Tottenham Hale Station : 41, 192, 230,123. Turn left from station and walk up Ferry Lane. Continue past the lights and turn left at Heron House into Hale Wharf. Access is at the pontoon gate.